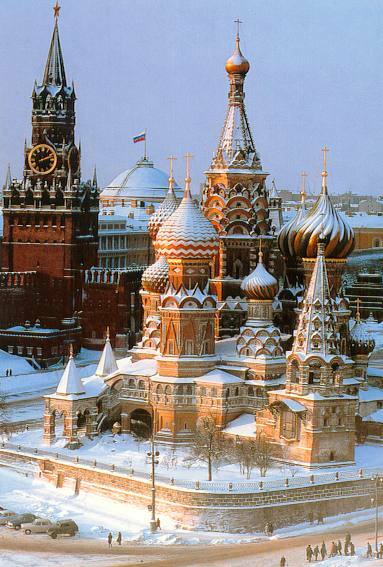 Kremlin: The powerful symbol that represents the greatness of medieval Muscovy culture and the Soviet Union. The space is spread over 1sq km with an ambience that is truly authoritarian. Such is the charm of the place that this is perhaps the first and most visited place by its visitors. Besides having one of the most fascinating and awe inspiring museums of the world, it is also the residence of the President. It reflects the traces of bygone era dating back to the medieval era in its squares, streets, churches, cathedrals, palaces, buildings, walls and towers. To soak in the historic memories one would need several days to complete sightseeing at this fascinating and enigmatic landmark of the city. Red Square: It remains the soul and pulse of the city for centuries. It is known to have attained its present name somewhere in the 17th century which otherwise was known as “Torg”. Visitors can witness the place where offenders were declared culprits but were put to execution at a faraway place. Among other attractions is the beautiful St. Basil’s Cathedral reflecting vibrant colors revealing its unique architecture. Monuments of Minin and Pozharsky, symbol of 17th century liberation struggle can be seen here. And again the embalmed body of Lenin is preserved in the pyramid bringing back the memories of the famous proletarian revolution. Assumption Cathedral: Known as the Mother Church, the Assumption Cathedral reflects the beautiful medieval architecture with a set of five golden domes representing Jesus Christ and the four Evangelists. Many heads of the church, dating back to the period between 1320 and 1700, is buried here. Interiors of the Cathedral reveal the use of Fresco paintings dating back to 17th century. It’s believed that around 150 artists were brought in from far off places to decorate the cathedral, lead by iconic painters like Sidor Pospeyev, Ivan and Boris Paisen. Recalling history, Napoleon’s troops used the place as their horse stable during the invasion. The Cathedral has seen and endured a lot of bloody turbulent times of history. Moscow’s Parks and Gardens: Known to be among the greenest capitals of the world, Moscow is the place to soak in some fresh air and enjoy green landscapes. The city has hundreds of parks with unique landscapes that is enigmatic and has a rejuvenating effect on its visitors. The most beautiful of the parks can be found in the noble area of 19th century like Kuskovo and Uzkoe. The parks are well connected and easily accessible from any corners of the city. Some of the parks like Gorky Park are very popular with children due to various options like skating, playground and ice sculptures etc. Visitors can engage in various fun activities like boating in the lake, enjoy some scary rides and enjoy wildlife in the nearby zoo. The botanical gardens are loved by nature lovers for its vast collection of colorful plants of different and rare species. Historical Museums: It once was aptly known as the “world capital of museums” due to its numerous museums, each with unique collections that reminds its visitors of a bygone historical era. The State Historical Museum of Russia reflects the unique styled architecture that was built in 1872. It has an array of archaeological collections including coins and medals. Another museum, The Old English Courtyard, used to be the residential place of then English merchants, is a historical monument with historical importance. Znamensky Monastery Museum, one of the old monuments that include a domed cathedral. Among the displayed exhibits are items like silver plates, dishes and trunks belonging to a rich boyar’s house dating back to 15th and 16th centuries. Borodino Battle Panorama Museum on the other hand exhibits battle scenes from the 1812 War against Napoleon. In short, the visitors will get so much and everything from its various museums based on different themes and all depicting an era of rich past.